April: Feria in Arles (corrida). july august: feast of the holy eloi, festivity vautives. September: Feria of rice in Arles. November, December: Christmas market (in all villages). April: Féria in Arles (bullfighting). July August: feast of the holy secluded, festivitated vautives. September: féria of rice in Arles. November December: Christmas market (in all the villages). The house was perfect, clean and well kept. We could not have asked for anything more. If you are going to the area the home's location is perfect for day trips. Trés belle maison convivial au coeur du village de St Etienne du Grès, oû nous avons passé un agréable séjour en famille. Situation calme à quelques pas du centre du village avec ses petits commerces mais aussi uniquement à km de St Rémy de Provence et de Tarascon. Everything you need for a wonderful holiday! Highly recommended. I would definitely recommend this house. We were there with a group of 8 friends and it was wonderful. The house has everything you need, from a pingpong table to a nice swimming pool, BBQ, clean and comfortable bathrooms, plenty of toilets, a nice outside dining area and garden... It almost felt like we were at home. 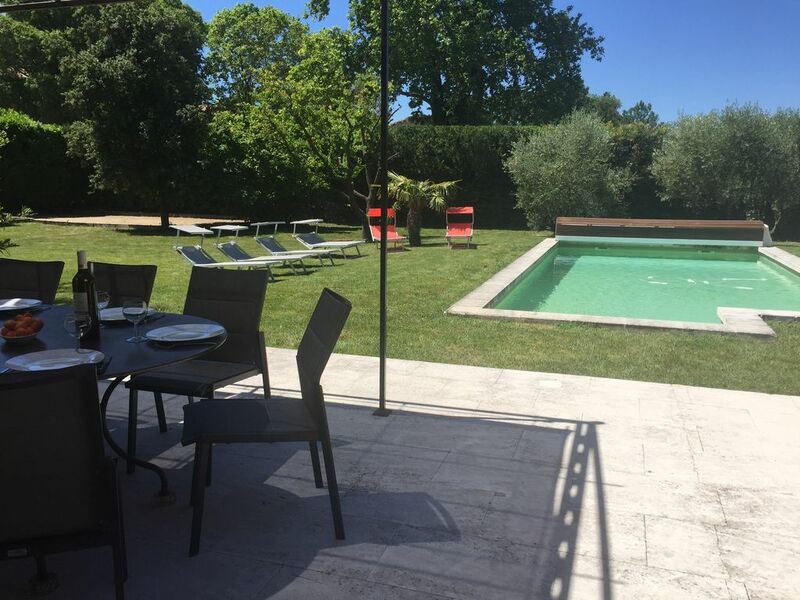 It's also a very nice area, with the beautiful Alpilles, Avignon, St. Rémy de Provence very close to the house. Supermarkets, bakery, ... are also very close which is easy if you need to do some grocery shopping. The house is located in a very quiet neighbourhood, and because of the fact that the garden is completely surrounded by trees, privacy is guaranteed. We also went for a run in the evening, which was very nice to do in this area. It doesn't matter if you like a calm holiday and like to stay at the house for a whole week or if you would like to do more active things as well: both options are possible! The owner has always been very friendly and helpful. He replied quickly to all of our questions. The owner couldn't be there when we arrived, but Valérie, a very friendly lady who cleans the house, was there to show us around. Upon arrival, everything went smoothly. A small thing that could be improved, is that it would have been nice if there were more (kitchen and bath) towels available, especially because we had to pay 100 euro for blankets and towels. It would have been convenient to have some extra, just in case. Overall, this is just a small detail. I am very happy that we chose this house, and I am sure that we would love to come back here someday when we are in this region of France. We had a wonderful stay! A great place for a multi-family vacation! We had a great holidays at this house. The town is small but has everything that you need. The yard was great for all the kids, the house was big enough that we all had our own room and it was very well equipped for playing, cooking and relaxing. The pool was great too. Nous avons passé de bonnes vacances dans cette maison. La ville est petite mais a tout ce dont vous avez besoin. La cour était grande pour tous les enfants. La maison était assez grande pour que nous ayons tous notre propre chambre et elle était très bien équipée pour jouer, cuisiner et se détendre. La piscine était géniale aussi. Merci beaucoup! Wir waren im Juni eine Woche mit Freunden in diesem tollen Haus in der Provence. Das Haus ist sehr schön eingerichtet,gut aufgeteilt und ausgesprochen gut gepflegt und sauber. Wir waren 9 Personen und ein Baby und hatten jede Menge Platz, sowohl drinnen als auch draußen. Der Garten ist ebenfalls sehr gepflegt und der beheizte Pool ist einfach spitze, wenn Kinder dabei sind (war natürlich auch für die Erwachsenen toll). Die Lage ist sehr praktisch als Ausgangspunkt für Ausflüge, außerdem ist das Dorfzentrum gleich um die Ecke mit Geschäften für die Nahversorgung, so dass man morgens frisches Baguette und Croissants vom sehr guten Bäcker holen kann. Mr Leborgne war sehr freundlich und hat uns alles gut erklärt und uns auch wärend des Aufenthalts gut betreut. Alles verlief reibungslos. Alles in allem kann ich das Haus uneingeschränkt empfehlen, das Preis-Leistungsverhältnis ist sehr gut. Danke für die schöne Woche!